Ever wonder what truly inspires your favourite musician? Find yourself imagining what their life story might be? Are you curious about what’s living behind the thin curtain of social media personas? 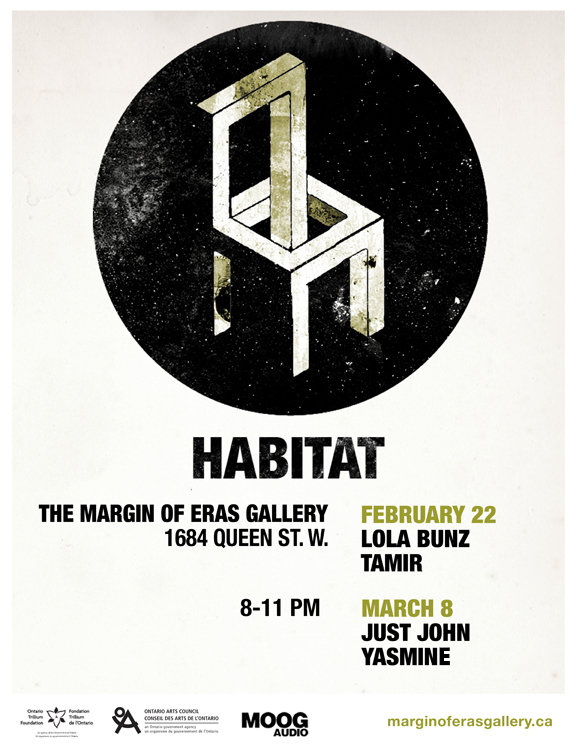 On February 22nd and March 8th, CUE invites you to the Margin Of Eras Gallery to explore the minds of four musicians—each of whom has built a fully immersive original installation. Their goal is to provide you with a deeper look into their complete habitat of inspiration and vulnerability. Each installation is conceptualized and completed by the musician, and consists of projections, a listening booth containing their music, interactive visual art, and an intimate live performance that you will not see on any other stage. You will leave with a true understanding of who they are as artists, and human beings. The Habitat Series was produced by Matthew Progress.